For the 29th annual Night of the Homeless, hundreds marched on Friday night to bring awareness to the city’s homeless—not only to the public, but government officials too. “In particular, this year we’re focusing on addressing the needs of women who are homeless,” said Marina Boulos-Winton, the Executive Director for Chez Doris, a day shelter for homeless women in Montreal. She said homeless women in particular have a lot of problems accessing shelter beds in Montreal. 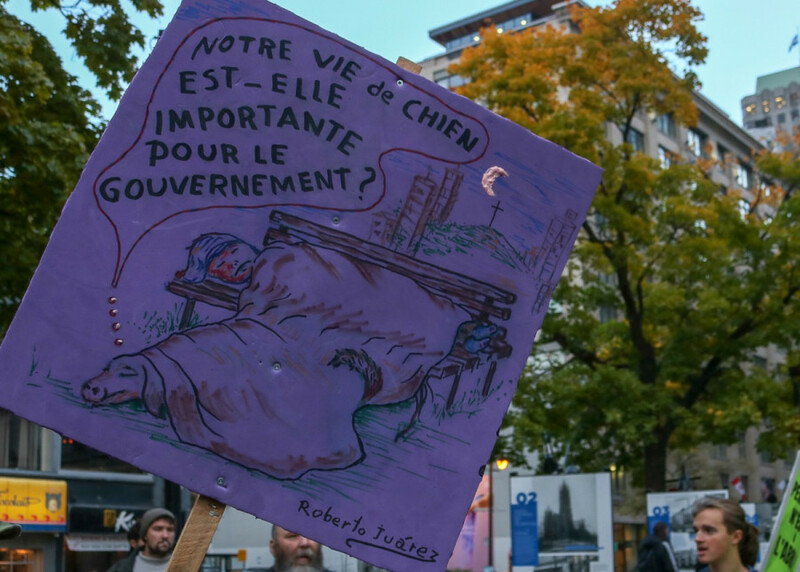 According to Boulos-Winton, women represent almost 25 per cent of the homeless population, and only 10 per cent of emergency shelter beds in Montreal are available for women—referring to an I Count MTL 2015 census. There are 738 beds for men in the city, continued Boulos-Winton, compared to the 84 available for women. “We have women on phones to reserve a bed at two o’clock, and within five minutes all the shelters are full,” said Boulos-Winton. She added that Chez Doris is the only day shelter for women that is open seven days a week. “Any woman can come no matter what sort of difficulty she has, though all are affected by extreme poverty,” said Boulos-Winton. The march began at Phillips Square, as participants walked along Maisonneuve St. West, ending at Cabot Square near Atwater metro. 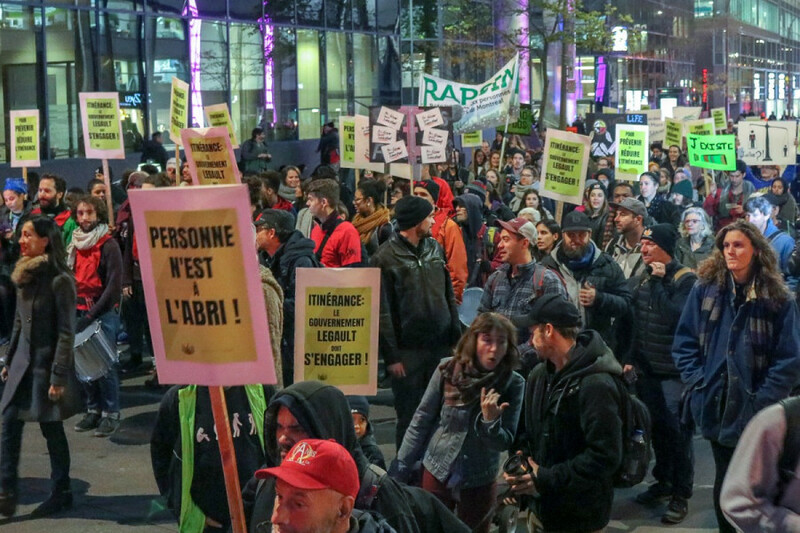 Those who took part in the march held fluorescent green picket signs, some of which read “Itinerance: Le Gouvernement Legault Doit S’Engager.” calling Quebec’s new government, lead by newly elected premier Francois Legault, to take homelessness more seriously. A number of other women shelters and organizations such as La Maison Marguerite, Le Chainon, Rue des femmes, Auberge Madeleine, and The Native Women’s Shelter were all there in support of homeless women. “They all complain that they do not have enough beds,” she continued. Director of Réseau d’aide aux personnes seules et itinérantes de Montréal Pierre Gaudreau agreed there needs to be more resources available for women facing poverty. Boulos-Winton said welfare rates in the province need to rise. Chez Doris also offers a Housing First grant, explained Boulos-Winton, which aims to help homeless Aboriginal women settle into private apartments. With the current welfare rate, Boulos-Winton said it’s difficult to help a single person find an apartment when their welfare is only $633 per month. “They’re not very motivated to stay in an apartment and because they’re constantly worrying about money because all they have left, after paying rent and utilities is [approximately] $50,” Boulos-Winton said. “All these Aboriginal women who are homeless, quite a few of them have children, and their children have been removed and are in youth protection,” continued Boulos-Winton. Gaudreau called for the Quebec’s new government and Legault, to invest in building more social housing, as well as an “increase in welfare cheques, not cuts”.